Although other series may receive more publicity and promotion, Lincoln cents are almost certainly the most widely collected of United States coins. There are probably millions of Americans filling coin folders from 1909 to date who are out of the numismatic mainstream and may know nothing of the organized hobby. 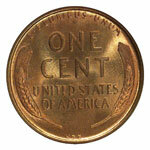 Many more are simply hoarding any and all "Wheaties," those cents bearing the old reverse of 1909-58. I'll repeat what I've said about other series, since it applies here as well: The grading of circulated Lincoln cents is a fairly straightforward process when one uses the illustrations and text found in The Official American Numismatic Association Grading Standards for United States Coins. There are, however, certain coins in this series that are exceptions to the usual grading rules, and these are listed in the book. Date/mint combinations that the ANA grading guide advises are often found with deficient strikes include: 1911-D, 1914-D, 1917-D, 1918-D, 1918-S, 1921, 1921-S, 1922-D, 1923, 1923-S, 1924, 1924-S, 1925- D, 1925-S, 1926-S, 1927-D, 1927-S, 1928-S, 1929-D, 1929-S, 1930-S, 1935-D and 1935-S. While each of these issues may indeed be found poorly struck from worn and indistinct dies, the truth is that all Lincoln cents produced by the Denver and San Francisco Mints from the years 1911-27 are often seen poorly struck from worn dies. When grading a circulated cent that lacks complete details a grading service such as NGC will take into account the overall surface condition of the coin. For instance, a 1920-S cent that shows only a few lines in the wheat ears (as a consequence of extreme die wear) yet possesses nearly full luster would grade About Uncirculated (AU) under a technical interpretation of grading, but the market grading employed by grading services may place this coin at some level of Extremely Fine (XF). While the lack of design detail detracts from the coin's appeal and value, it does not relegate it to the level of Very Good (VG), the grade that normally denotes a coin displaying only a few wheat lines. This is the important distinction between a worn die and a worn coin. The issue of strike is less important when grading unworn or mint state coins. Here, market grading really comes to the forefront, as the most important factors when determining the grade of a mint state coin are surface quality, luster and color. Surface quality simply refers to the number of contact marks and abrasions a coin has received. 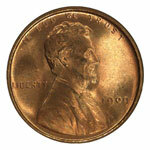 Being small coins, Lincoln cents can't display very many marks without being severely downgraded. 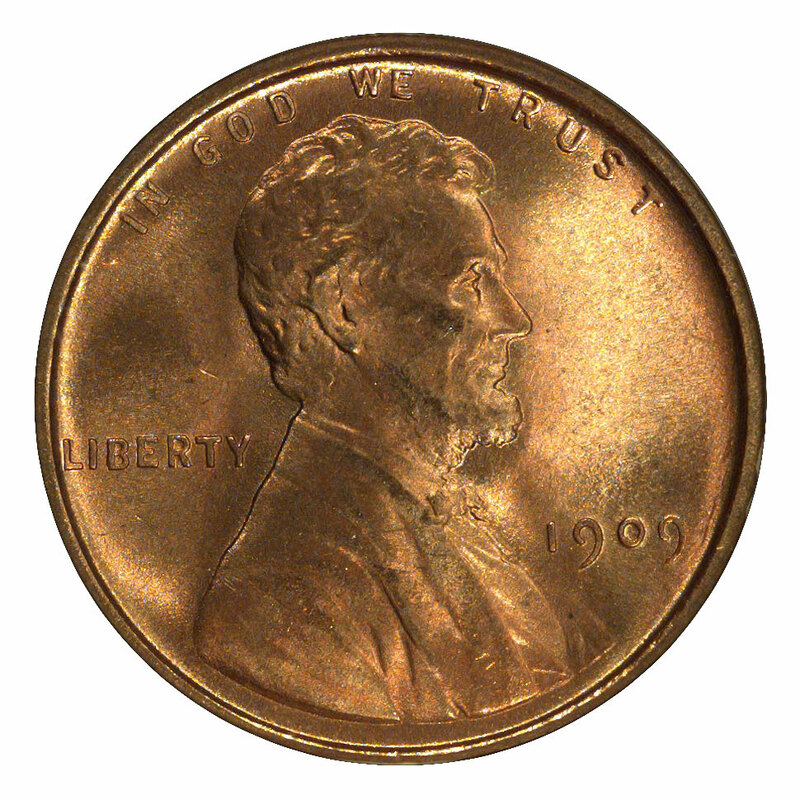 A tiny nick or scratch may be relatively hidden in Lincoln's hair or the lines of the wheat ears, but a mark in the open field of a mint state coin (particularly on the obverse) can lead to the loss of one or more grading points. Particularly serious are marks or abrasions through the date and mintmark; these can result in significant downgrading. 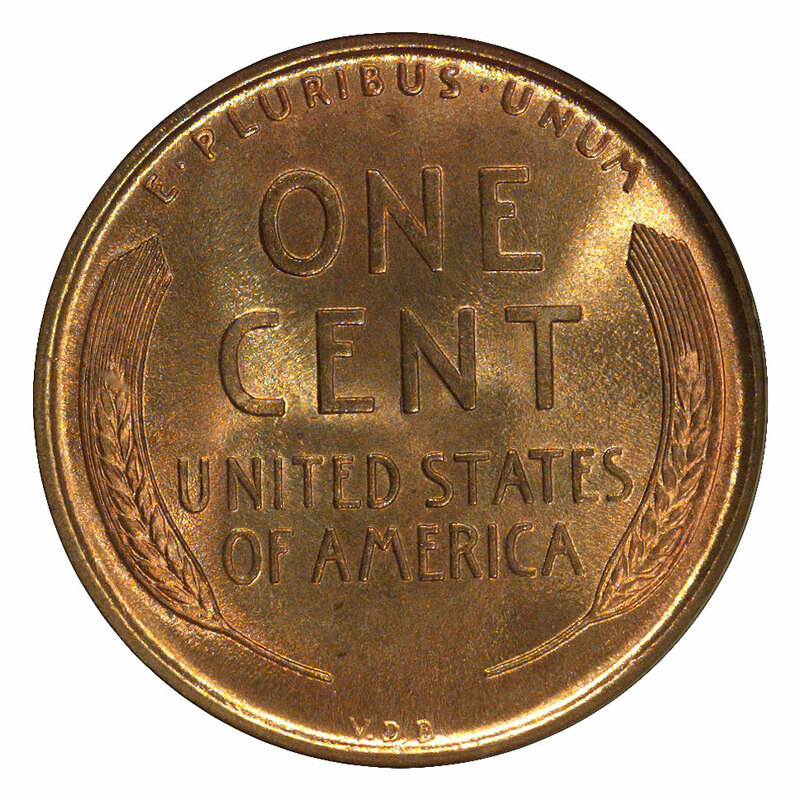 The mellowing of a cent's original bright-red or brassy color to a more subdued shade of red or brown is a natural process. With copper or bronze coins the variables of luster and color are often intertwined. A highly lustrous cent can be fully brown or possess remarkable, multicolor toning, but most collectors still prefer to see at least some mint red. Beautifully toned cents can achieve a higher grade by virtue of their outstanding eye appeal, one of the principal components of market grading. Luster is important in all instances, since it provides the backlighting necessary to bring out a cent's appeal, whatever its color. There is no fixed rule for designating a Lincoln cent red (RD) versus red and brown (RB) or simply brown (BN). As a general rule, RD cents exhibit about 85 to 90 percent of their original color, while RB cents display at least 15 to 20 percent red. Any coin with less red or non-red coloration will be designated BN.